Get the most out of in-line inspection programs. 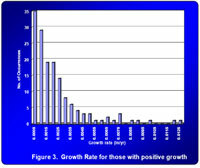 Distribution of growth rates from a comparison of two consecutive in-line inspections. Excavation timelines projected with reasonable and justifiable growth rates provide a platform to economically create excavation and re-inspection programs.